From washing dishes to prepping meals and even giving the baby a bath, your sink sees action every single day. Many of us think of our sinks as relatively clean places (after all, we do clean things in it) but in reality soap scum, food residue and germs all build up on the surface. Not only is this unhygienic, but it can also lead to your sink losing its shine, discolouring and wearing faster than it should. Fret not though; cleaning your sink needn’t be a chore. Our simple tips will keep your sink sanitised and sparkly clean! Check out our Stainless Steel Sinks! 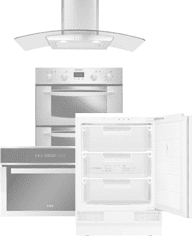 Stainless steel is actually a breeze to clean and can be done in a matter of minutes. To sanitise your sink, at the end of the day fill it with warm water. Drop a tablespoon of bleach in to the bowl and give it a swish around. Give your faucet a wipe with a sponge dipped in the water and then leave it to sit for five minutes. Once the time’s up, drain the sink and leave it to air dry – no need to wipe down or dry off! If you spot any scratches you can buff them away using stainless steel polishing creams. Avoid leaving wet sponges in the bowl or on the draining board as the standing water can cause discolouration. Never use chlorine bleach products on stainless steel sinks as this will break down the protective layer that makes it truly stainless. Shop our full range of Composite Sinks, starting from £69.99! Despite their rough and tough nature, composite sinks need a little care and attention when it comes to cleaning. Wiping down regularly with warm soapy water and a soft cloth will keep most of the germs at bay. When you need a really deep clean, you can create a mixture of 50% water and 50% white vinegar and use a soft cloth to wipe around the bowl. This should remove any lime scale deposits and sanitise the sink at the same time. Make sure you thoroughly rinse the sink with warm water afterwards and dry it off to prevent build up or damage to its surface. Shop our CDA Ceramic Sinks! Ceramic sinks can get stained over time, especially if they are light in colour. For a light clean, a simple wipe down with warm soapy water will suffice. For a deeper clean, mix lemon juice and vinegar together and give it a good scrub. Rinse thoroughly with warm water and then dry it off. Your sink should now be sparkly clean. For deeper stains and overall discolouration, fill the sink with warm water and biological washing powder and leave it overnight. Drain in the morning, wipe down and rinse thoroughly. Easy. Avoid using strong chemicals including bleach and ammonia as this can cause damage to the surface. If neat bleach should come into contact with your sink, wipe it down immediately and rinse thoroughly with warm water. There’s no need to rush out and spend loads of money on fancy cleaners. Believe it or not, you can give your sink a deep clean with ingredients you probably already have in your cupboards. Start by rinsing your sink out with water. Make sure that you remove any lingering pieces of food or obvious bits of grime. Then sprinkle a thin layer of baking soda over the bottom of the sink. Grab your sponge and get scrubbing; work your way round the entire bowl and faucets using circular motions. Once you’re done scrubbing, pour a little vinegar in to the sink. It’ll fizz, but don’t worry. Give it another lights scrub, the vinegar acts as a natural disinfectant and will remove any water stains or marks. 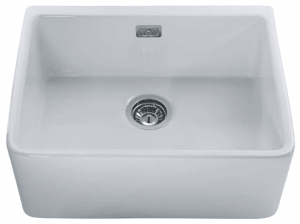 Save money on our range of sinks with options to suit any budget and interior. In stock for free and fast delivery when you buy today! Rinse out your sink using water and get rid of all residues. Now you can use your bonus ingredient, if you choose. Simply rub the peel skin-side all over the sink. This will give it a lovely fresh smell. Finally grab your kitchen towel and add a few drops of olive oil to it. Rub this round the entire bowl to help keep it sparkling for the next couple of weeks. Easy! Previous Previous post: What Type of Kitchen Sink Should I Buy?